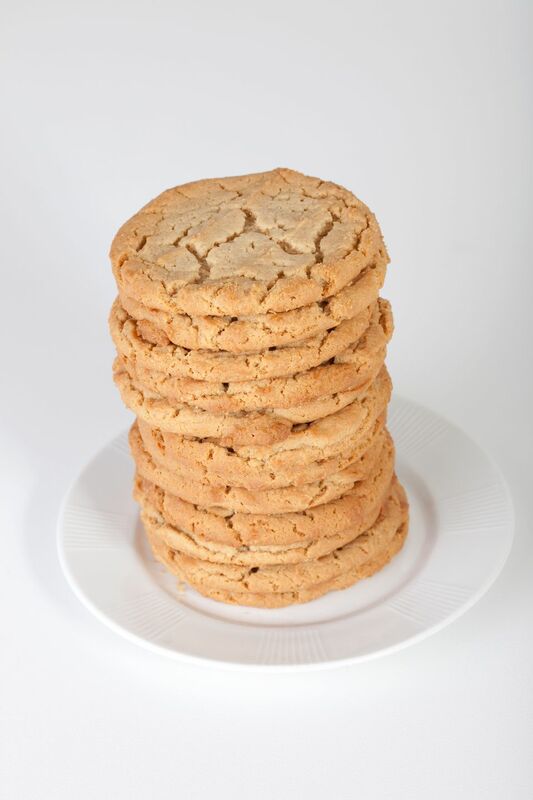 These peanut butter cookies are made using the classic icebox cookie method. The cookie dough is shaped into logs, refrigerated, and then sliced and baked when you're ready. The thin cookies are also perfect for peanut butter and jelly sandwich cookies. Let the cookies cool and then fill them with your favorite jam or jelly, or fill them with a chocolate or vanilla icing or chocolate ganache. The logs of cookie dough may be frozen as well, so feel free to double or triple the recipe. Enjoy fresh-baked peanut butter cookies whenever you have a craving! In a mixing bowl with an electric mixer, beat the shortening and butter together until creamy Add the granulated and brown sugar and beat until light and fluffy. Add peanut butter and eggs to the creamed mixture; blend well. Sift together the flour and baking soda; stir into creamed mixture. Shape the cookie dough into 2 rolls about 2 inches in diameter. Wrap in waxed paper and refrigerate until thoroughly chilled. Line baking sheets with parchment paper or leave them ungreased. Slice the chilled rolls of dough into rounds about 1/8-inch thick; arrange the cookies on the prepared baking sheets. Bake the cookies in the preheated oven for 8 to 10 minutes. Chocolate Drizzle: In a small saucepan over low heat, combine 1 cup of semisweet chocolate chips with 4 teaspoons of vegetable shortening. Stir constantly until the mixture is smooth and melted. Place the cooled cookies on a cooled baking sheet lined with parchment paper or foil. Drizzle the chocolate over the cookies and place the baking sheet in the freezer for a few minutes, or until the chocolate is firm. Store Longterm: Freeze well-wrapped rolls of cookie dough for up to 6 months. When it's time to bake, take the rolls of cookie dough out of the freezer and slice. Arrange the cookies on a baking sheet. Bake the cookies as directed, allowing a minute or two extra baking time. Create Home-made Sandwich Cookies: Sandwich the peanut butter cookies with a filling of jam, jelly, icing, or chocolate ganache.